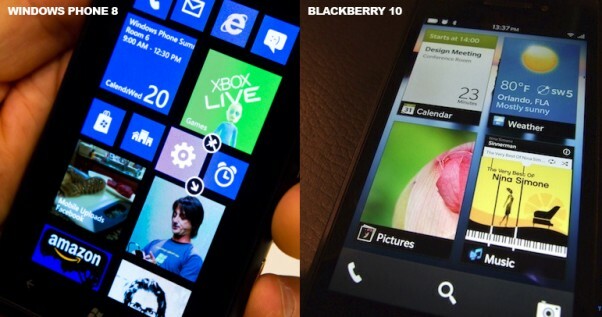 Windows Mobile vs RIM: Who can take third place in the phone war? The war for third place is hotting up, with Windows 8 in full distribution and RIM about to bring BlackBerry 10 to the world. Both companies seem to be fluttering on the edge of failure in the mobile world, yet with their new line of products, their may be light at the end of the dark tunnel. For RIM, BlackBerry 10 is their last stitch attempt at competing with the big boys. For years now they have almost rejected the Apple and Android way of mobile devices, instead claiming their devices were superior. They are now starting to understand the error of their ways. With a full range of devices from cheap to expensive, touchscreen to keyboard, RIM have set out to make availability their number one priority. They have also said they will license BlackBerry 10 to other manufacturers, so they can create their perfect BB10 phone. Windows Phone has a different kind of story, instead of Microsoft taking the lead role and only role in making the phones, they have no role. Instead, they looked to Nokia, their trusted ally, to make good smartphones for them. This didn’t work out very well, until the Nokia 900 that was cut short by Microsoft’s new Windows 8 full ecosystem idea. The Nokia 920 is doing well now, but it seems the only device that is doing well, with HTC, Huawei and Samsung versions of the Windows phone selling poorly. We are unsure. RIM seem to be gaining momentum and we are seeing a lot of people getting genuinely excited for the BlackBerry 10 launch. The same can already be said about Windows 8 phone, with a lot of Windows and Nokia fanboys commenting all the time, telling us that Windows is the perfect mobile operating system and we should never judge. In our view, Android is looking to dominate with open source technology, iOS is slipping and RIM and Windows phone are growing. Where we go from here is the consumers decision, and the consumers answer to innovative and excellent technology.